The Yellow Switch Palace is a level in the game Super Mario World that contains a giant, yellow ! Switch. It is the first Switch Palace that Mario and Luigi find, as the palace is not hidden. It is on top of Kappa Mountain in the northwest of Yoshi's Island, and is accessed by completing Yoshi's Island 1. The entire level contains no enemies or power-ups (and is the only Switch Palace to do so), and cannot be replayed after it has been completed, at least without the aid of an exploit in Super Mario World: Super Mario Advance 2. The palace consists of two rooms, which the player has 200 seconds on the timer to complete. The first room of the palace is a large open area with a single P Switch. 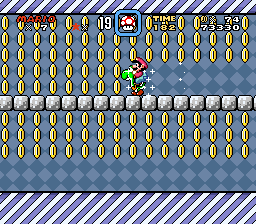 When the switch is hit, the room gets filled with about 500 coins, and the player has about ten seconds to collect as many as possible; however, the player is not required to hit the P Switch to progress through the level. A Warp Pipe guides the player to the second room, which contains the yellow ! Switch. The player can simply jump on top of it to activate it and end the level. Once the yellow ! Switch is activated, all the yellow Dotted Line Blocks turn into yellow ! Blocks. During gameplay, a Super Mushroom appears when a yellow ! Block is hit. These blocks also help the player progress through levels by filling in some gaps. The yellow ! Blocks only appear in 21 levels after that. This page was last edited on April 5, 2019, at 11:46.